So I went for a scenic drive up to Burnie to visit my friend, Alexander the Great, and his beautiful family. I had thought I was in the midst of a health kick but Alexander the Great has as many dry days as Robert Downey Jnr, so I had a beer in my hand within two minutes of stepping in the door. As tomorrow was yet another sunny midwinter day (the Antarctic vortex never got further south than the mainland) we decided we would walk up a mountain. Not far away was a mountain called St Valentine’s Peak (named after the former Hobart Major I assumed) which Alexander was keen to get to the top of. He didn’t know a lot about it but, much like his historical namesake, once he had seen something, he pretty much had to conquer it, so that was that. There was one minor problem. Alexander had anticipated that a walk might be on the cards, but instead of warning me, he asked told a mutual friend named the Great White Hunter to tell me. This didn’t happen, so I turned up without any decent hiking gear. As a result we set off the next day with me wearing jeans and a pair of trainers, and with little in the way of spare warm clothing. Luckily Alexander was pretty sure it was a short walk so I figured even if I was as well prepared as Jack Watts for his AFL debut, what was the worst that could happen? Well, when we pulled into the car park we were greeted by this sign, which had the same effect on my optimism as an anti-Islam rally has on racial harmony. But we thought we may as well walk anyway. I might get a little wet, but we could always dry off by the fire when we got home. Alexander said he thought it was a 2-3 hour walk and we expected to be on the fast side of that. 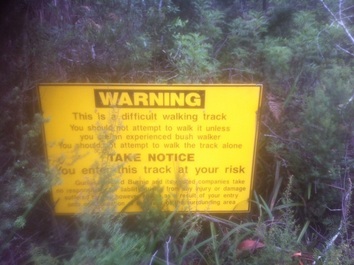 Much like the Blues in Origin 3, the first thing the track did was fall away, which was a promising start. The muddy track twisted between the moss covered trunks of tall trees for about five minutes before we came to a bridge that looked like it belonged in the same era as Tony Abbott (50 years ago). The top of a slippery log sat just higher than the level of the river that ran beneath it. A loose line of rope had been strung across at waist height to help walkers balance as they crossed. Being the graceful athletes we were, we crossed the ‘bridge’ with little difficulty (picture a skinny rhinoceros on a balance beam). We actually paused to help a family come across behind us by supplying some weight to put tension on the balance rope (a task we seemed well-suited to), before setting off again. The next short section was very boggy. To my relief, much of the muddiest parts were covered by wooden boards, but there were occasional gaps between these sections that were very difficult to keep dry in. I was pretty glad when we came to another bridge, which compared to our first the way an ABC journalist compares to a Today Tonight journalist (and I know I’m using that term very generously at this point). At this point, the track began to rise out of the swampy part so the ground became a little drier (meaning less wet, not a small laundry appliance for anyone that is not sure on the different spellings). It was still muddy from melted snow and rain, but the slope prevented much moisture staying to form puddles. All of a sudden, a vehicle track appeared from nowhere. We turned onto it and follow it for 700m (well that’s what the sign said) before finding the next section of the walk. After that, the gradient increased more sharply than the government’s efforts to hide what is happening on the Manus Island detention centre. The trees we were walking through became smaller and densely clustered and the track contorted around them like a Reclaim Australia bigot around the truth. As we pushed higher, we started seeing patches of clear sky to either side of the way shreds of truth are appearing in the Marriage Equality debate. With the land dropping away on both sides, we realised we were on a much narrower ridge than we had realised. This became obvious when we suddenly came out of the surrounding vegetation and realised how quickly the ground dropped away from us in almost every direction. Snow and ice appeared pretty quickly at this point, coating the low vegetation and lightly covering much of the rocks. We were now walking and scrambling up a narrow ridge towards what we thought was the summit a few hundred metres away. As it turned out the path didn’t even go to the top of this rise, but skirted around to the right, heading for higher peak some distance away. It was at this point we became sure that this was not a 2-hour walk. The path here was seriously overgrown by scrubby bushes. Luckily for me, my jeans protected me from getting scratched by the branches. Less luckily for me, my jeans absorbed all of the water and snow from said branches soaking me from the waist down. We moved pretty quickly up towards the next supposed summit. On arriving, we realised the path continued on towards another couple of even higher points, with something even bigger looming in the clouds beyond them. We were now mainly picking our way over icy rocks and still with a dramatic drop off to either side of us (nothing dangerous, but spectacular in its scope nonetheless). There was a fair bit of ice and snow around too, so we had to be quite careful in places. If you didn’t like heights, this might not have been the walk for you. At one point Alexander waited puzzled as I seemed to have stopped just ahead of him staring catatonically at a patch of ice. “Check this out,” I said just as he was wondering if I’d had a stroke, pointing to the dark drops of water that were running underneath the ice, like tiny fish or tadpoles. Just prior to the final climb was a very exciting little narrow ridge that I wouldn’t have wanted to do in high wind. We made our way across carefully and found the going was much easier for the last hundred metres. There was a little hut and a bank of solar panels in a flat section just below the summit. I can only assume they are still there because Mr Abbott (is non-renewable energy one if his portfolios?) hasn’t heard about them yet. When we reached the top, Alexander the Great was looking emotional. I thought perhaps he might weep because there was no more mountain to conquer. The top which was marked with a couple of plaques and a radio tower. There was also a square wooden platform that might have been a helicopter landing pad (in case Bronwyn Bishop wanted to come up). Alexander the Great produced a couple of beers and we drank them whilst looking at the surrounding mountains. Once we stopped, the cold became pretty intense and, being ill-equipped, I was starting to shake worse (well more anyway) than Taylor Swift. We decided to jog a little (where possible) to warm up, so we were quite quickly back to the point where we dropped below the treeline. The first stage of the descent was pretty rapid. The muddy track was slippery, but there were plenty of trees to grab for balance. After we had crossed the vehicle track it flattened out a little and soon I was squelching through the lowest part of the walk between the two rivers. By the time I crossed the second bridge, I was that wet that I could have pretty much walked straight through the river, not that I was tempted to test this theory. We got back to the car a few hours later than anticipated, which is pretty good in comparison to the delays with the F35 JSF program, having taken a little over four hours on the walk. Of course, one of the great things about Tassie, is you are often not far from something else awesome as soon as you finish whatever you are doing. In this case we were only about half an hour from the Hellyer's road distillery so we finished the afternoon with a couple of nice glasses of whisky looking out over the green hills behind the restaurant.